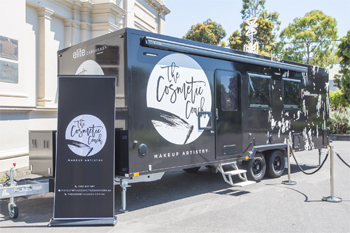 Melbournians searching for high-quality, convenient hair and make-up solutions for weddings and other formal events are set to benefit from Melbourne's first luxury mobile beauty salon, created by Australia's leading caravan manufacturer, Elite Caravans. The Cosmetic Coach is the brainchild of make-up artist, Chantelle Pettinella. She came up with the concept while she was travelling across Europe. "Mobile services are very popular overseas and I felt that this was something we didn't have available in Melbourne, particularly for the beauty and wedding industries," said Ms Pettinella. "I have always found there was never enough space or great lighting when you're doing make-up in homes. We help clients get away from the mess and chaos, especially when you're getting ready for a wedding and step into a room of luxury within a few steps from your front door. "We offer a luxury mobile salon stocked only with high-end products, backed by a professional and accountable makeup artistry team. The best thing about the Cosmetic Coach is that we bring the luxury and decadence to you. Whether you're after a natural, flawless everyday look or a more dramatic and glamorous style, we will bring your vision to life," she said. "I worked closely with the team at Elite Caravans to bring my business vision to life. It was difficult to find a company that would allow me to customise my caravan to my exact specifications, but with Elite there were no limitations. "We went through a thorough process with many stages as it is a custom built caravan. I was very involved in the process - from design right through to manufacturing. Their dedicated innovation team and team of caravan experts were committed to finding the best solutions for my business," she said. Adrian Cappola, Elite Caravans Managing Director, said the company creates award-winning bespoke caravans to suit the needs of all consumers and small businesses across the country. "From mobile beauty vans and man caves to pop-up wineries and cafes, we've got something to inspire everyone. We custom build all our caravans and we are committed to making it work for you. We only use leading innovation, premium products, the latest tools, the best minds and the most flexible attitude. Just name it and we will make it a reality," Mr Cappola said. Winner of 2013 and 2015 Caravan Manufacturer of the Year and the only caravan manufacturer in the world to be featured on the Discovery Channel, Elite Caravans has an in-depth understanding of the needs of Australian caravaners. Combining meticulous design with high quality manufacturing and world-first technologies, Elite Caravans are built to withstand the Aussie landscape while remaining innovative and stylish. Visit www.elitecaravans.com.au and www.thecosmeticcoach.com.au for further information. Question: What inspired you to begin The Cosmetic Coach? Chantelle Pettinella: I came up with the concept while I was travelling across Europe. Mobile services are very popular overseas and I felt that this was something we didn't have available in Melbourne, particularly for the beauty and wedding industries. I have always found there was never enough space or great lighting when you're doing make-up in homes. We help clients get away from the mess and chaos, especially when you're getting ready for a wedding and step into a room of luxury within a few steps from your front door. Question: What is The Cosmetic Coach? Chantelle Pettinella: The Cosmetic Coach is Melbourne's first luxury mobile beauty salon, created by Australia's leading caravan manufacturer, Elite Caravans. We offer a luxury mobile salon stocked only with high-end products, backed by a professional and accountable makeup artistry team. The best thing about the Cosmetic Coach is that we bring the luxury and decadence to you. Whether you're after a natural, flawless everyday look or a more dramatic and glamorous style, we will bring your vision to life. Question: What's a typical day like for you, as The Cosmetic Coach? Chantelle Pettinella: A typical day for me doesn't exist! Every day is different and I enjoy the fact that each day is a new adventure. Summer is always a popular time for weddings so at the moment I am busy with an average of one wedding per week. On a day of a wedding booking, I normally get up early to ensure I'm organised and arrive at the client's house ahead of time. With The Cosmetic Coach, I would get up earlier than I normally would as I have to factor in parking of the caravan. Sometimes I receive bookings from people who live in apartments and don't have access to parking so I have to factor that in. I normally investigate and know this ahead of time, but it's always good to be there early. We like to allow 45 minutes to an hour for each person making sure colours work well and that the client is comfortable and happy with their look. When I'm not doing make-up, I'm teaching make-up artistry or trying to get the word out there on The Cosmetic Coach. Eventually I want to do make-up lessons in The Cosmetic Coach so I'm looking forward to getting that underway. Question: What was the most challenging part about setting up The Cosmetic Coach? Chantelle Pettinella: Finding the right manufacturer to build The Cosmetic Coach was the biggest challenge. I needed specific lighting and mirrors and it was difficult to find a manufacturer who could build exactly what I was looking for. Through some research online, I came across Elite Caravans who create bespoke caravans, and the rest they say is history! Question: What was it like working with Elite Caravans? Chantelle Pettinella: I enjoyed working with Elite Caravans to make my dream come true. I worked closely with the team to bring my business vision to life. It was difficult to find a company that would allow me to customise my caravan to my exact specifications, but with Elite there were no limitations. We went through a thorough process with many stages as it is a custom built caravan. I was very involved in the process - from design right through to manufacturing. Their dedicated innovation team and team of caravan experts were committed to finding the best solutions for my business. Question: What are the top five make-up products, you could not live without? Chantelle Pettinella: Prep and prime spray. This is a product I encourage all brides to wear. It helps foundation stay on for longer. 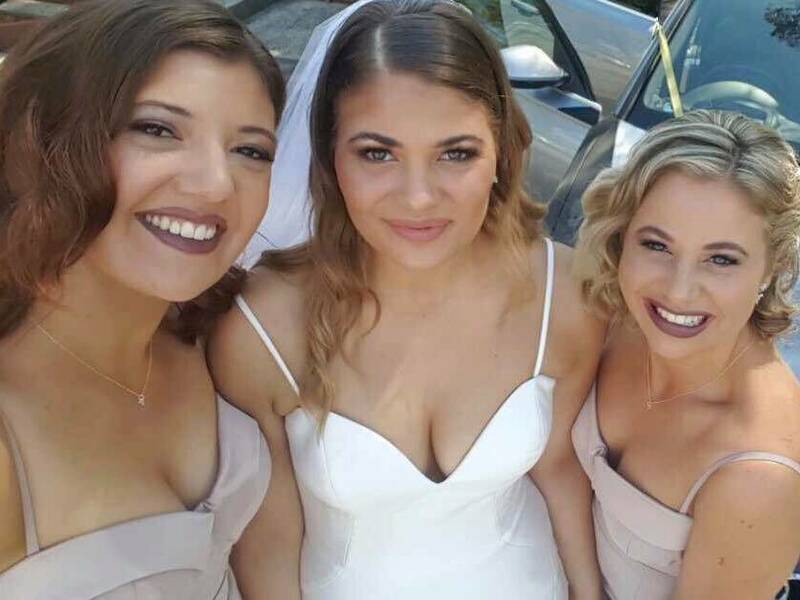 Brides are often cheek kissing a lot of people on their wedding day so when foundation does start to wear out, a quick re-spray can help add moisture and help with patchiness. Eye primer is another product I love. It gives my clients long-lasting eyeshadow and it makes the colour pop out a bit more. Good powder to help set the foundation. It also helps foundation last and gives the bride a matte look which works well on an oily skin type. Eyebrow gel adds colour and helps keep the eyebrows in shape throughout the day. Question: Do you have favourite makeup brands? Chantelle Pettinella: I love MAC, Model Rock Lashes, Pout Cosmetics, NARS and Temptu Pro. That said, I don't limit myself when it comes to brands. I'm a former beauty therapist so I have a good eye for analysing skin types. My priority is my client's skin and make-up so I always choose a brand or product I know this going to go well with my client's skin. Question: Can you share your top five bridal make-up tips? Always pack a small emergency kit including lipstick and powder for a touch up on your special day. Do your make-up trial early in the morning. That way, you can see how the makeup wears throughout the day. Never book a facial a week before your wedding day, because you don't know how your skin will react. Instead drink plenty of water in the lead up and have a great skincare regime so your skin looks flawless.